Matt C: This has been tucked away in my ‘To Read’ pile for a few months now, primarily because I felt it was a tome that needed to be consumed in one go rather than in bite-sized chunks, and time wasn’t allowing me to crack it open. With a few hours finally to spare I can confirm that the decision to read the whole thing in a single sitting was the right one, as Things To Do In A Retirement Home Trailer Park proves to be an unforgettably moving comic book experience. An autobiographical tale in which a young man cares for his dying father, it resonates so strongly because it plays into the classic father-son dynamic where the usual order of things is to display as little emotion as possible. Wright digs deep into his relationship with his dad, from the often frightening figure he remembers in his youth to the gradually deteriorating old man he’s confronted with now. In a way, he adapts and reconfigures his own version of the Five Stages Of Grief model, because as well as the more familiar elements such as Denial, Anger and Acceptance, he also makes way for Regret to come into play. This manifests itself in not only how Wright deals and reacts to the situation but also how his father copes with the knowledge that his time on the planet is quickly coming to an end. The book contains a multitude of potent insights into human nature, many of these immediately familiar but always welcoming re-emphasis, and the undercurrent of genuine feeling that runs through the pages is as strong as you're ever likely to see in the pages of a comic, graphic novel, or whatever you wish to call this medium we love so much. And, I’m not ashamed to admit, there are some lines of dialogue and certain images here (often in combination) that generated a powerful enough emotional response in me that there may very well have been a tear or two shed. 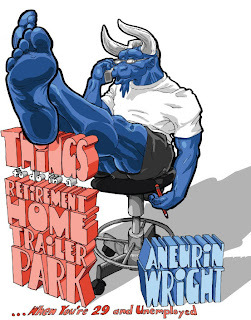 The words held within Things To Do In A Retirement Home Trailer Park have an undeniable truth to them but they wouldn’t have been nearly as effective without the illustrations that act as their accompaniment. 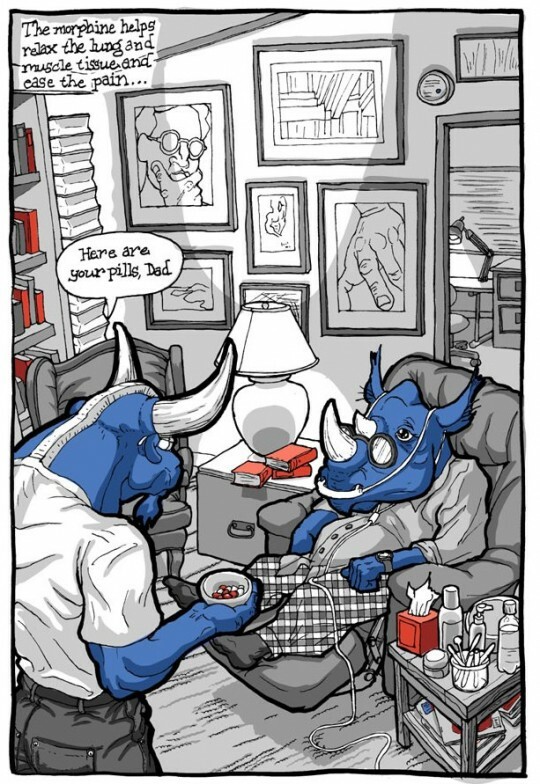 Wright’s decision to present himself as a blue-skinned minotaur and his father a anthropomorphic rhino pays off as it allows him to take diversions into flights of fantasy with ease, but also accentuates the black humour of the tale, preventing it from becoming a harrowing and depressing experience. His solid, exaggerated figurework constantly exudes warmth and heart even during the more outlandish dreamscape vignettes.